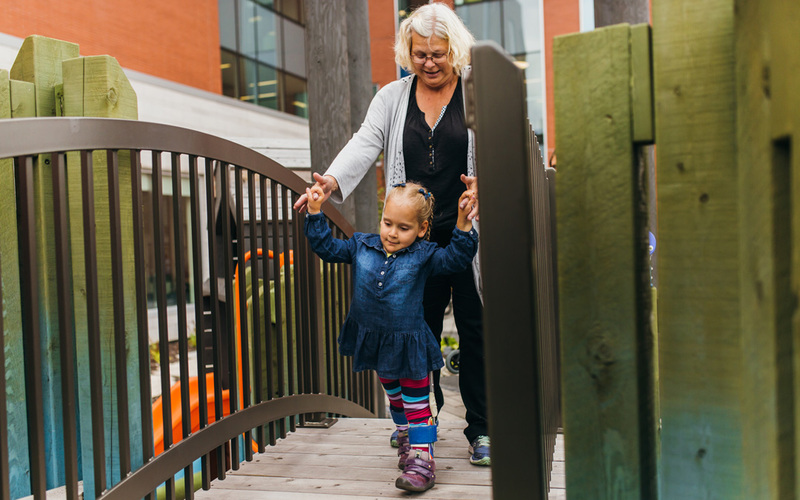 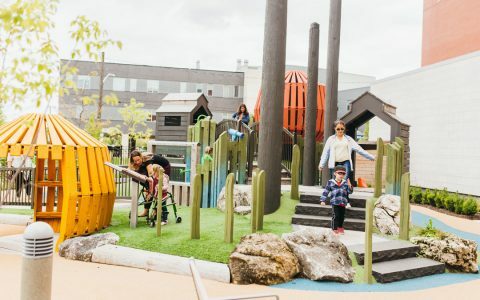 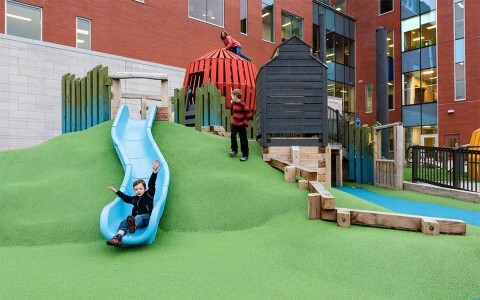 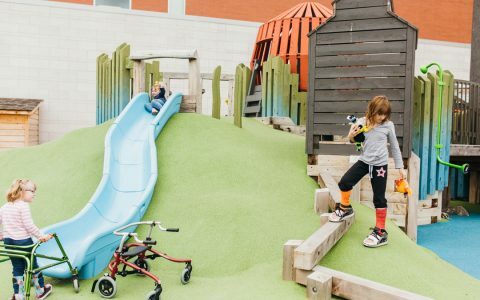 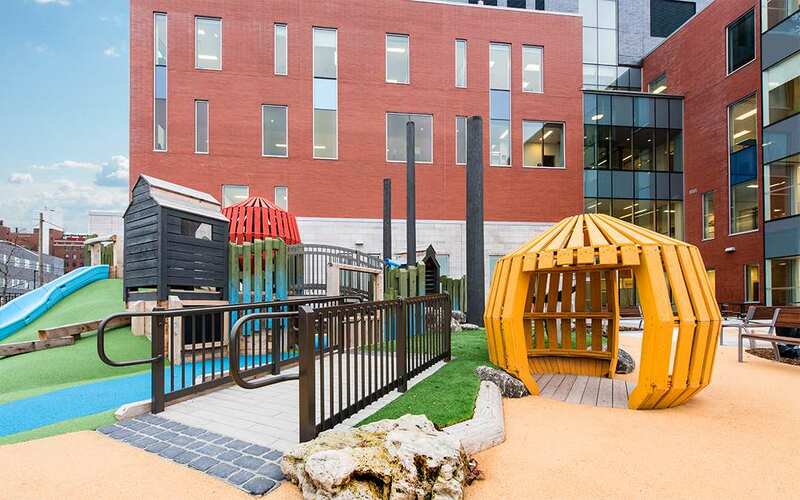 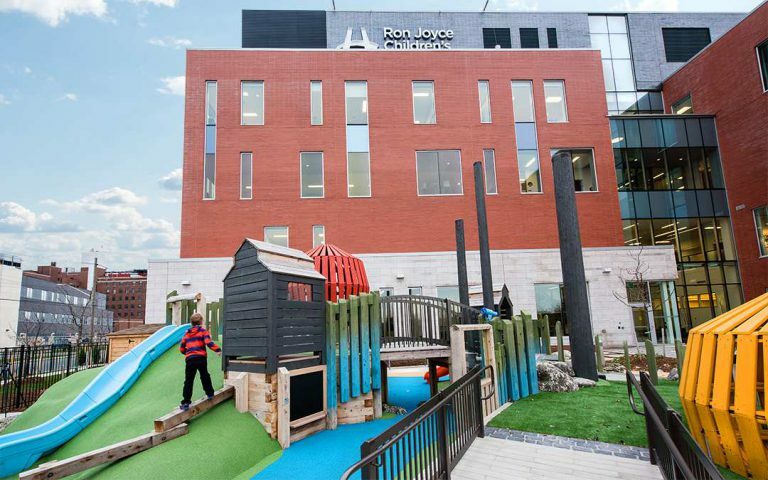 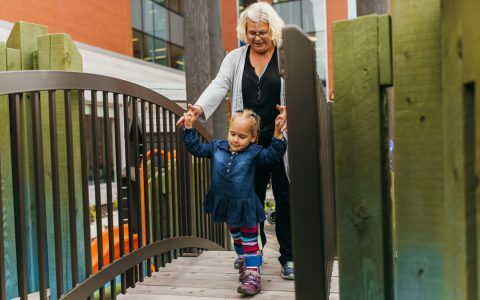 This fully accessible playground was constructed at The Ron Joyce Children’s Health Center, a brand new facility associated with McMaster Children’s Hospital and Hamilton Health Sciences. The only facility of its kind in Canada, it was purpose-built to offer a range of integrated programs and medical services to children, youth and their families. 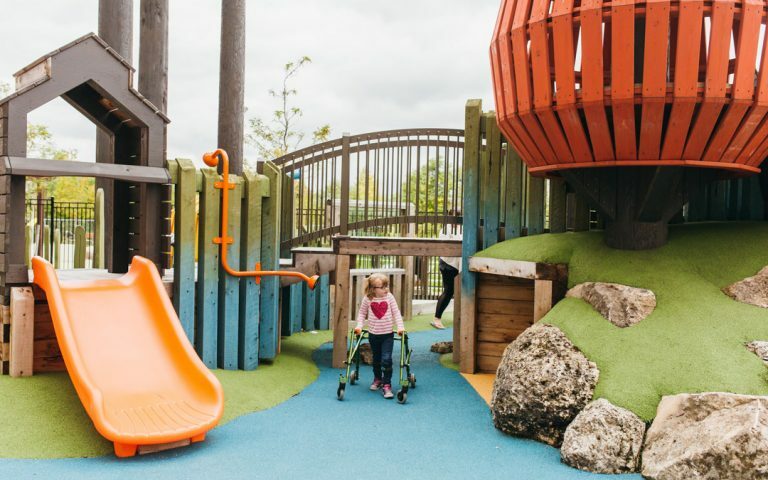 The custom accessible playground was designed as a part of the rehabilitation and therapy program for children with a wide spectrum of disabilities. 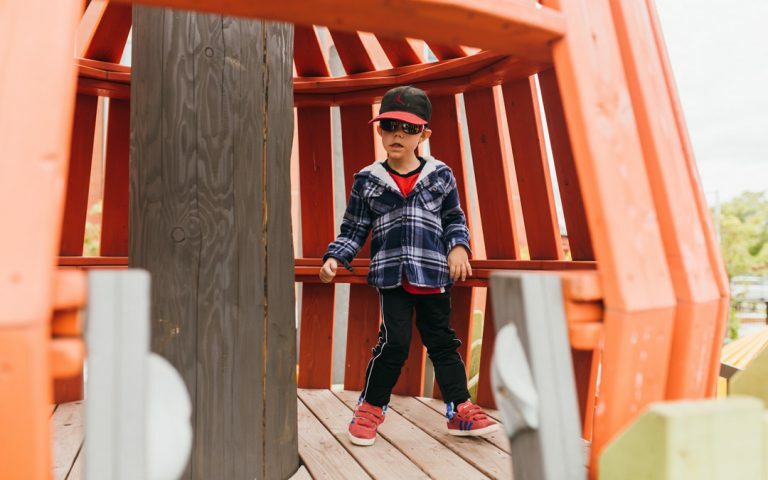 The playground had to meet AODA (Accessibility for Ontarians with Disabilities) requirements as well as Annex H of the CSA Children’s Play spaces and Equipment Standard (CAN/ CSAZ614-07). 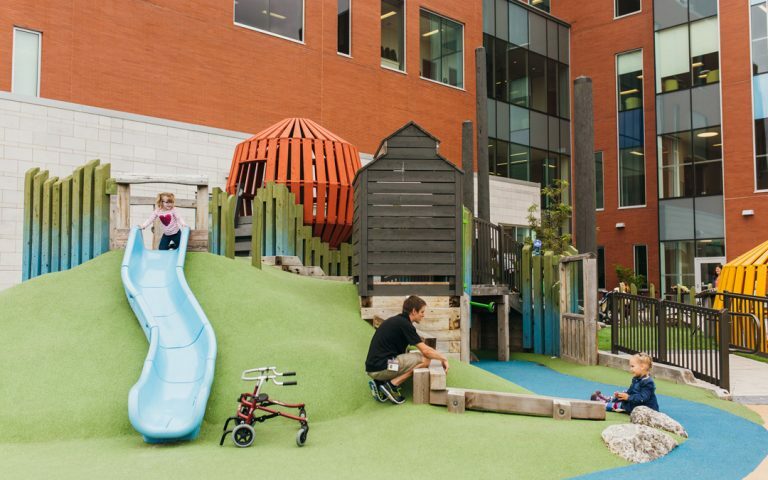 The multi-level playground was designed with input from over 20 doctors, accessibility consultants, and therapists who work with children receiving treatment and therapy at the center. It is themed to represent the City of Hamilton including its iconic bridges, steel mills, and the colourful autumn trees of Cootes Paradise. 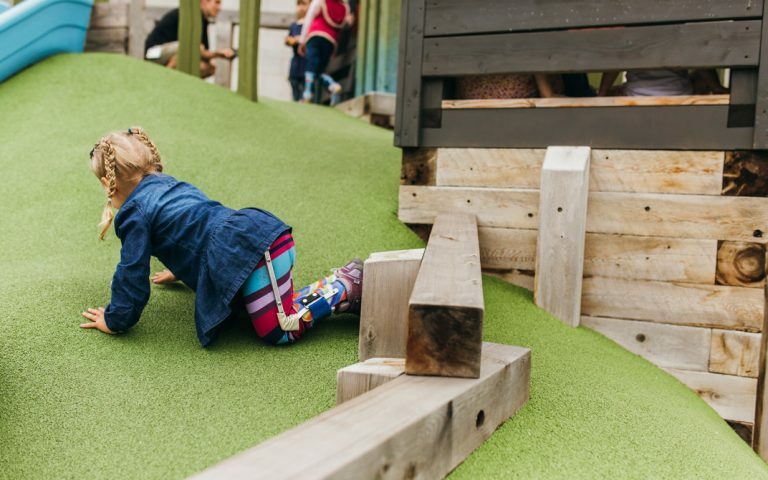 The play components engage children’s senses – the feel of the hand carved wood, the muted colours of nature, the sounds of clatter as they wheel or walk over rumble bridges. The structures offer graduated challenge for children so they can continue to develop their kinaesthetic awareness and abilities. 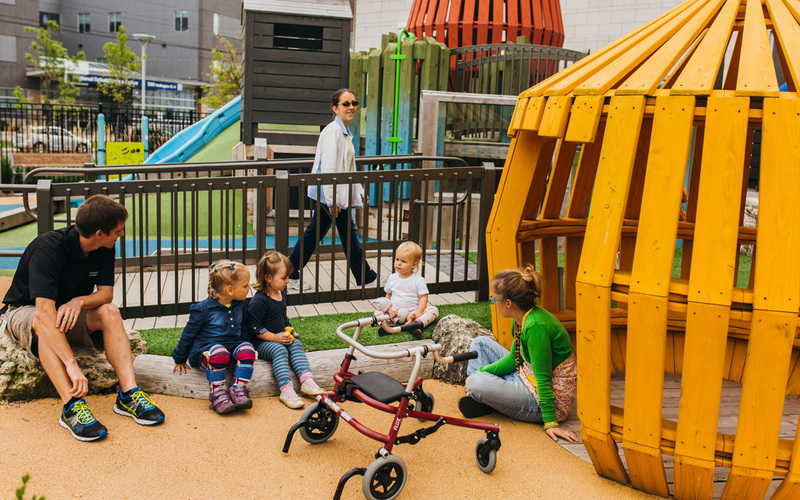 Children visit the playground with parents and/or their therapists. 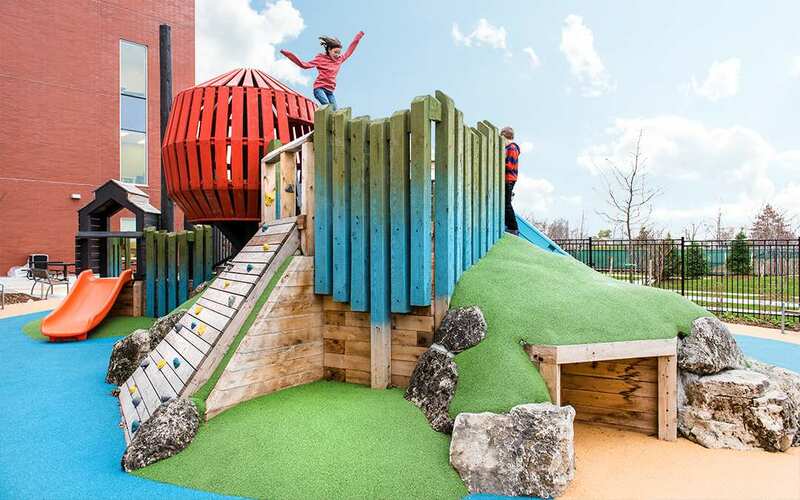 They can choose from a variety of routes and paths that include ramps, stairs, beams, climbing walls and ropes. Children gain strength, courage, confidence and endurance as their treatment progresses and different parts of the playground are mastered. 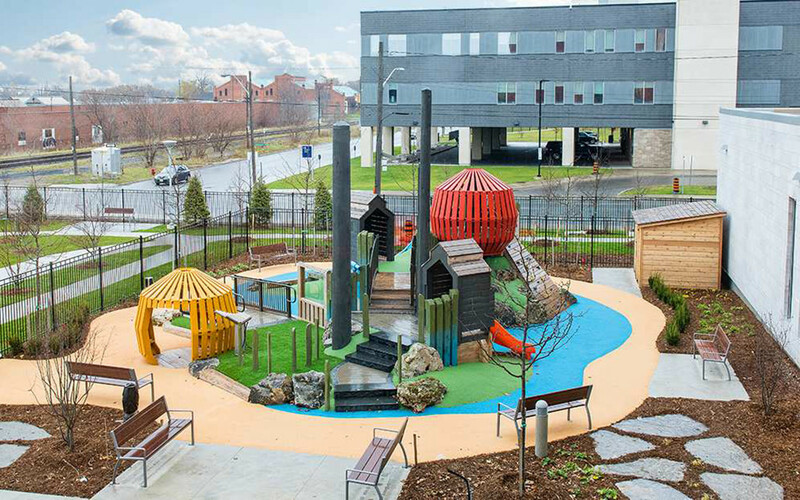 Pathways: Interconnected, coloured, and accessible pathways link play opportunities; blue represents the Hamilton waterfront. 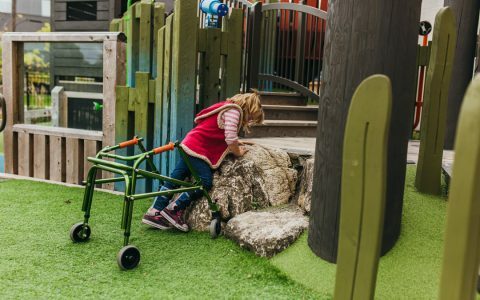 An outer perimeter pathway serves as a running, walking circuit or mini wheeling track. 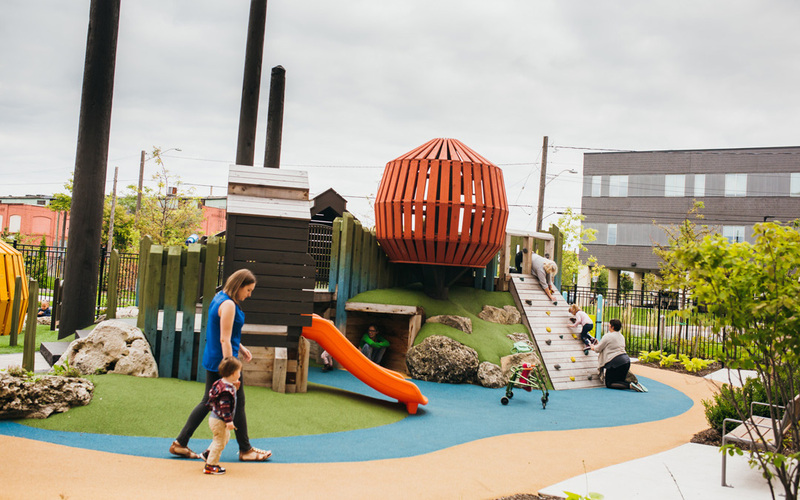 Berms: The steel mills and smoke stacks reflect the City of Hamilton and were custom designed and constructed to serve as play houses along the connected elevated paths. The colourful autumn trees of Cootes Paradise can be accessed at ground level or atop the berm and were designed so that caregivers and therapists can maintain site lines while still giving children the sensation of being in a private, enclosed space. 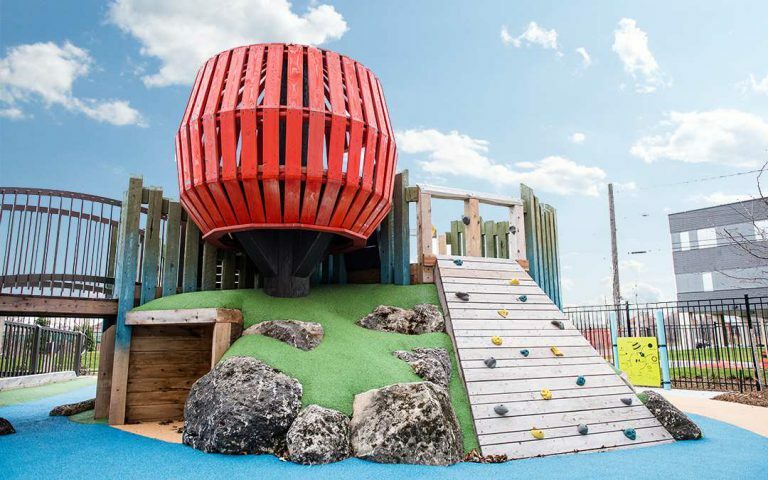 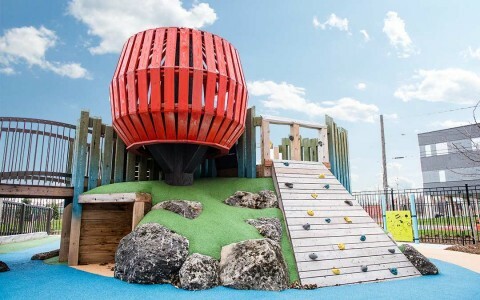 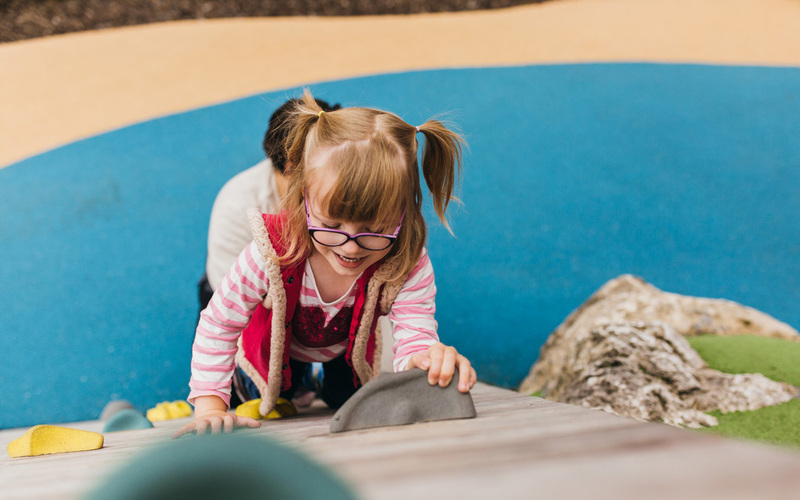 Climbing routes/elements: The varied topography of the playspace enables multiple routes and elements with different degrees of steepness and difficulty so children can climb, wheel, balance and develop upper body strength as they manoeuvre up climbing walls, along raised balance beams, and over boulders. Bridges/Ramps: The clatter bridge introduces a fun element that stimulates proprioception, vestibular stimulation and kinesthetic awareness. Ramps connect children to slides and create pathways underneath for children to walk/run/wheel.